The 2016 ICC World Twenty20, will have a group stage to be competed by the qualified Associate teams — Ireland, Netherlands, Oman, Afghanistan, Hong Kong and Scotland — along with the two lowest-ranked Full Member sides — Bangladesh and Zimbabwe. 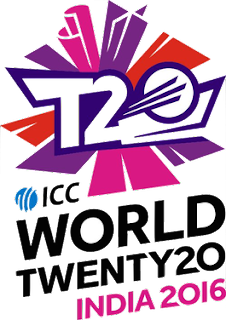 One team from each group will qualify for the main group and join the top eight Full Members on the ICC T20I Team Rankings in the second round — Super 10. Group A: Bangladesh, Netherlands, Ireland and Oman. Group 1: Sri Lanka, South Africa, West Indies, England and Afghanistan. Group 2: India, Pakistan, Australia, New Zealand and Bangladesh. AFGHANISTAN – Asghar Stanikzai (capt. ); Dawlat Zadran; Gulbadin Naib; Hamid Hassan; Hamza Hotak; Karim Sadiq; Mohammad Nabi; Mohammad Shahzad; Najibullah Zadran; Noor Ali Zadran; Rashid Khan; Samiullah Shenwari; Shafiqullah Shafaq; Shahpoor Zadran and Usman Ghani. AUSTRALIA – Steve Smith (capt. ); Ashton Agar; Nathan Coulter-Nile; James Faulkner; Aaron Finch; John Hastings; Josh Hazlewood; Usman Khawaja; Mitchell Marsh; Glenn Maxwell; Peter Nevill; Andrew Tye; David Warner; Shane Watson and Adam Zampa. BANGLADESH – Mashrafe Bin Mortaza (capt. ); Abu Hider; Al-Amin Hossain, Arafat Sunny, Mahmudullah, Mohammad Mithun; Mushfiqur Rahim; Mustafizur Rahman; Nasir Hossain, Nurul Hasan; Sabbir Rahman; Shakib Al Hasan; Soumya Sarkar; Tamim Iqbal and Taskin Ahmed. ENGLAND – Eoin Morgan (capt. ); Moeen Ali; Sam Billings; Jos Buttler; Liam Dawson; Steven Finn; Alex Hales; Chris Jordan; Adil Rashid; Joe Root; Jason Roy; Ben Stokes; Reece Topley; James Vince and David Willey. HONG KONG – Tanwir Afzal (capt. ); Nadeem Ahmed; Haseeb Amjad; Jamie Atkinson; Waqas Barkat; Ryan Campbell; Chris Carter; Mark Chapman; Babar Hayat; Aizaz Khan; Nizakat Khan; Waqas Khan; Adil Mehmood; Anshuman Rath and Kinchit Shah. INDIA – Mahendra Singh Dhoni (capt. ); Ravichandran Ashwin; Jasprit Bumrah; Shikhar Dhawan; Ravindra Jadeja; Virat Kohli; Pawan Negi; Ashish Nehra; Hardik Pandya; Ajinkya Rahane; Suresh Raina; Mohammed Shami; Rohit Sharma; Harbhajan Singh and Yuvraj Singh. IRELAND – William Porterfield (capt. ); Andrew Balbirnie; George Dockrell; Andrew McBrine; Tim Murtagh; Kevin O’Brien; Niall O’Brien; Andrew Poynter; Stuart Poynter; Boyd Rankin; Max Sorensen; Paul Stirling; Stuart Thompson; Gary Wilson and Craig Young. NETHERLANDS – Peter Borren (capt. ); Wesley Barresi; Logan van Beek; Mudassar Bukhari; Ben Cooper; Timm van der Gugten; Vivian Kingma; Ahsan Malik; Paul van Meekeren; Roelof van der Merwe; Stephan Myburgh; Max O’Dowd; Michael Rippon; Pieter Seelaar and Sikander Zulfiqar. NEW ZEALAND – Kane Williamson (capt. ), Corey Anderson, Trent Boult, Grant Elliott, Martin Guptill, Adam Milne, Mitchell McClenaghan, Nathan McCullum, Colin Munro, Henry Nicholls, Luke Ronchi, Mitchell Santner, Ish Sodhi, Tim Southee and Ross Taylor. OMAN – Sultan Ahmed (capt. ); Aamir Kaleem; Aaqib Sulehri; Adnan Ilyas; Ajay Lalcheta; Amir Ali; Bilal Khan; Jatinder Singh; Mehran Khan; Munis Ansari; Rajeshkumar Ranpura; Sufyan Mehmood;; Vaibhav Wategaonkar; Zeeshan Maqsood and Zeeshan Siddiqui. PAKISTAN – Shahid Afridi (c), Ahmed Shehzad, Anwar Ali, Imad Wasim, Khalid Latif, Mohammad Amir, Mohammed Hafeez, Mohammad Irfan, Mohammad Nawaz, Mohammad Sami, Sarfraz Ahmed (wk), Shoaib Malik, Sharjeel Khan, Umar Akmal, Wahab Riaz. SCOTLAND – Preston Mommsen (capt. ); Richie Berrington; Kyle Coetzer; Matt Cross; Josh Davey; Ali Evans; Con de Lange; Michael Leask; Matt Machan; Calum MacLeod; Gavin Main; George Munsey; Safyaan Sharif; Rob Taylor and Mark Watt. SOUTH AFRICA – Faf du Plessis (capt. ); Kyle Abbott; Hashim Amla; Farhaan Behardien; Quniton de Kock; AB de Villiers; JP Duminy; David Miller; Chris Morris; Aaron Phangiso; Kagiso Rabada; Rilee Rossouw; Dale Steyn; Imran Tahir and David Wiese. SRI LANKA – Lasith Malinga (capt. ); Dushmantha Chameera; Dinesh Chandimal; Niroshan Dickwella; Tillakaratne Dilshan; Rangana Herath; Shehan Jayasuriya; Chamara Kapugedera; Nuwan Kulasekara; Angelo Mathews; Thisara Perera; Sachithra Senanayake; Dasun Shanaka; Milinda Siriwardana and Jeffrey Vandersay. WEST INDIES – Darren Sammy (capt. ); Samuel Badree; Sulieman Benn; Carlos Brathwaite; Dwayne Bravo; Johnson Charles; Andre Fletcher; Chris Gayle; Jason Holder; Ashley Nurse; Denesh Ramdin; Andre Russell; Marlon Samuels; Evin Lewis, and Jerome Taylor. ZIMBABWE – Hamilton Masakadza (capt. ); Tendai Chatara; Elton Chigumbura; Tendai Chisoro; Graeme Cremer; Luke Jongwe; Neville Madziva; Wellington Masakadza; PJ Moor; Richmond Mutumbami; Tinashe Panyangara; Sikandar Raza; Vusimuzi Sibanda; Malcolm Waller and Sean Williams.